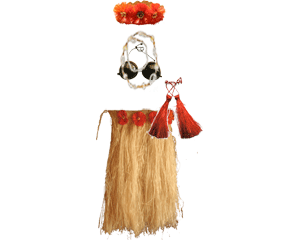 Made from plant fibers (from the bark of "purau" tree), this costume is embellished with accessories and ornaments from the natural Polynesian environment (pearl, feathers, shells, etc.). 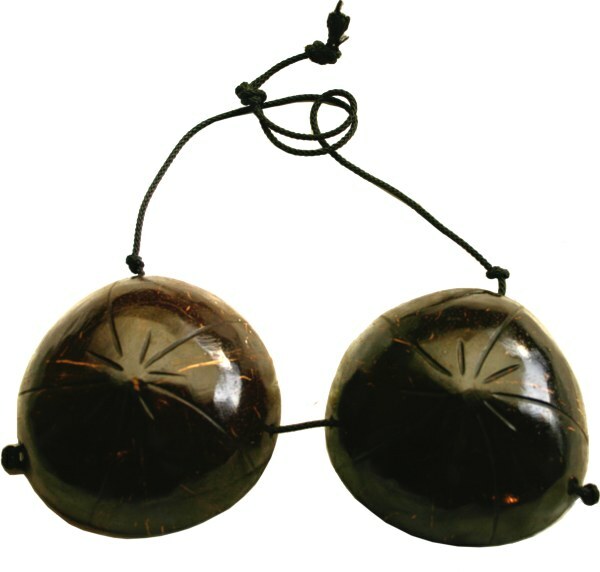 Used long time ago for religious ceremonies, today the costume is frequently used during traditional show, and especially during the festival "Heiva" held each year in July. Entirely handmade, this costume come from the Papeete's market. Colors and decorations may vary from one model to another according to inspiration and creativity of the artisan. The skirt goes to the calves but it can also be wear at the knees. It is therefore possible to easily adjust to desired length using scissors. The cords located at the belt allow an easy adjustment for the hip. The colors and ornaments can vary from one model to another according to the inspiration and creativity of the artisan (photo not contractual). The petticoat is systematically of natural fiber color. The pompoms, crown and belt ornaments are available in 3 basic colors : natural, red, orange, or mixed fiber. You must specify the color of the ornaments when ordering (in the comment field of the order form). Available on order only : around 3 days manufacturing time.